The Original Atrium Full Forklift Cab Enclosure. This is a perfect item for those foul weather days .. The Fork-Stor easily slips over the forklift in seconds. Fits most lifts up to 8,000 lbs. This is manufactured from the most durable fabrics and is great for the yard or warehouse, keeping your lifts resale value high. 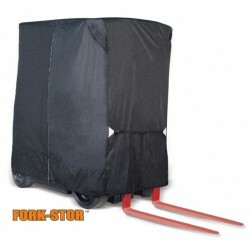 The Fork-Stor easily slips over the forklift in seconds. Fits most lifts up to 8,000 lbs. This is ma.. 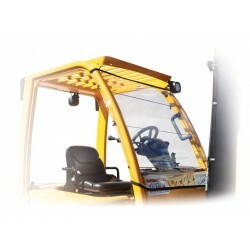 The Forkshield is universal for all the lifts on the market and can be used as a canopy or a windshield. Made from superclear material great for protection from rain and snow when working. The forkshield attaches with built in bungee cords, just wrap around roof poles and attach back to itself. Fits all lifts. The Forkshield is universal for all the lifts on the market and can be used as a canopy or a windshi.. 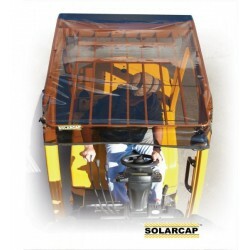 The Original Solarcap Forklift Sun and Rain Canopy. 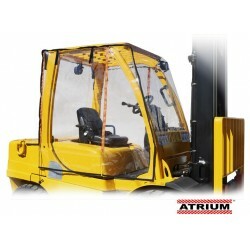 This forklift sun canopy fits every lift on the market. Oversized for a pull down visor. Keep the sun off the operator while working. No more squinting while having an overhead load. Perfect for yard and warehouse use. Prevent operators from getting sunburns and hit by falling debris. The Original Solarcap Forklift Sun and Rain Canopy. This forklift sun canopy fits every lift on the ..